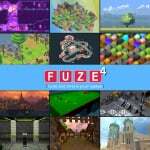 FUZE Technologies Ltd has shared the news that its upcoming educational coding platform release, FUZE4 Nintendo Switch, has been delayed until the end of next month. If you've missed our previous coverage of this one, the software features a comprehensive selection of tutorial projects which allow users to get to grips with the ins-and-outs of game programming concepts. Reminiscent of original BASIC, but revitalised and redesigned to align itself with modern coding languages like Python, Java, and C++, it has been designed with simple commands to give beginners an easy route in, while also being powerful enough to write "stunning quality games and apps" in both 2D and 3D. “In all honesty we’re all a bit disappointed to have delayed further but there really was no other option. The 31st of May is a comfortable date as we’re already in the final stages, no new features are being added just testing and adding as much tutorial and help content as we can. FUZE4 Nintendo Switch is special as there really is nothing else like it. We always knew we could come up with the goods but none of us realised quite how impressive the final release version would be. It’s fast, intuitive and very accessible. If you want to learn more about FUZE4 Nintendo Switch, you can check out the official website right here. It's certainly an interesting release on the horizon for the console; we'll make sure to keep an eye out for more news in the coming weeks. Are you interested in learning how to code your very own games? Let us know if you'll be checking this out when it launches on 31st May in the comments. I am absolutely interested, if I can learn something I'm in. I could begin with this software to get an idea and then begin to code something with my pc. More tools for Preorder Peril! I didn't notice anything suggesting it allows you to import assets. If you can't, I'd struggle to be interested enough. @namesnipe No. I can't find my source now but it will cost somewhere around the £23 mark. I think if you gonna code your own games a better way will be to learn a more common language (+framework). @gcunit If you go on the eShop store page, it says in the description "Use the included game graphics & audio or create your own". I suppose the software can read files from the MicroSD (.obj, .wav, .png, etc), but I'm not so sure it will work like this. Well that's cool, that's cool. We've been waiting for a full year now on PetitComputer, since the announcement of that one, and supposedly it releases within the next few months. So between the two of these, both newcomers and old timers in code tinkering should be pleasantly distracted for the summer. @Anti-Matter whats a "windows Prompt"? @oji At the same time, this may be useful for people who aren't any good at self-teaching to maybe learn beginning coding concepts. In the end, no, it's not going to train anybody up to a professional level, but it doesn't hurt to have utilities out there that might help to demystify the concept of writing code to those of us (like me) who would otherwise be helpless when left to their own devices to have to self-teach not just a language, but the very concept of coding itself. @TheFongz could be... In that case I believe it will be extremely basic. I don’t think there will be any kind of 3D model editor for example. @Anti-Matter that is incorrect actually. What you can see in the video is a code editor and not a command line interface. @Cathousemaster it does support usb for sure, it says at the start. I’m looking forward to this. I know there are similar things out there for iOS but playing your own things on the Switch is going to be a real blast! Question: what is that keyboard at the beginning, really like it! Programming is something I do have interest in but unfortunately I lack the patience needed to learn. RPG Makers and the like are more my territory. "The game will ship with a Sprite editor for making your own 2D assets and you can generate some fantastic 3D images (we've got a fully rendered pool table!) using just shapes in game"
Interesting. Could be a nice way to start coding for beginners. How about the games you finished, any way to share them with other people? My son is interested in programming and I think there's a chance he might choose to do it for a living someday. Could this "game" possibly be a good starting point?